Naaman, commander of the army of the king of Syria, was a great man with his master and in high favor, because by him the Lord had given victory to Syria. He was a mighty man of valor, but he was a leper. Now the Syrians on one of their raids had carried off a little maid from the land of Israel, and she waited on Naaman's wife. She said to her mistress, "Would that my lord were with the prophet who is in Samaria! He would cure him of his leprosy." So Naaman went in and told his lord, "Thus and so spoke the maiden from the land of Israel." And the king of Syria said, "Go now, and I will send a letter to the king of Israel." So he went, taking with him ten talents of silver, six thousand shekels of gold, and ten festal garments. And he brought the letter to the king of Israel, which read, "When this letter reaches you, know that I have sent to you Naaman my servant, that you may cure him of his leprosy." And when the king of Israel read the letter, he rent his clothes and said, "Am I God, to kill and to make alive, that this man sends word to me to cure a man of his leprosy? Only consider, and see how he is seeking a quarrel with me." But when Elisha the man of God heard that the king of Israel had rent his clothes, he sent to the king, saying, "Why have you rent your clothes? Let him come now to me, that he may know that there is a prophet in Israel." So Naaman came with his horses and chariots, and halted at the door of Elisha's house. And Elisha sent a messenger to him, saying, "Go and wash in the Jordan seven times, and your flesh shall be restored, and you shall be clean." But Naaman was angry, and went away, saying, "Behold, I thought that he would surely come out to me, and stand, and call on the name of the Lord his God, and wave his hand over the place, and cure the leper. Are not Abana and Pharpar, the rivers of Damascus, better than all the waters of Israel? Could I not wash in them, and be clean?" So he turned and went away in a rage. But his servants came near and said to him, "My father, if the prophet had commanded you to do some great thing, would you not have done it? How much rather, then, when he says to you, `Wash, and be clean'?" So he went down and dipped himself seven times in the Jordan, according to the word of the man of God; and his flesh was restored like the flesh of a little child, and he was clean. Then he returned to the man of God, he and all his company, and he came and stood before him; and he said, "Behold, I know that there is no God in all the earth but in Israel." When Jesus had come to Nazareth, he said to the people in the Synagogue: "Truly, I say to you, no prophet is acceptable in his own country. But in truth, I tell you, there were many widows in Israel in the days of Elijah, when the heaven was shut up three years and six months, when there came a great famine over all the land; and Eli'jah was sent to none of them but only to Zar'ephath, in the land of Sidon, to a woman who was a widow. And there were many lepers in Israel in the time of the prophet Elisha; and none of them was cleansed, but only Naaman the Syrian." When they heard this, all in the synagogue were filled with wrath.And they rose up and put him out of the city, and led him to the brow of the hill on which their city was built, that they might throw him down headlong. But passing through the midst of them he went away. Indifference and lack of faith. The river Jordan plays a very important role in the Bible. Before it becomes the river in which Jesus the Messiah baptized, it is revealed as the river which bounds the "Promised Land." To cross the Jordan, for the people of Israel, was to enter into the fulfillment of the Lord's promises. It was to enter the "land flowing with milk and honey," the place where God would dwell with His people providing them with the endless blessings of His presence. When Joshua came to the Jordan the streams parted at the presence of God's people, with the priests bearing in their hands the Ark of the Covenant. As the waters of the sea parted to allow God's people to pass through as if on dry land at their exodus from Egypt, so also at the entry into the land of promise, the river of Jordan made way for God's people to pass through into the place of their final destination (Joshua 3:11-13). The Lord also commanded Joshua to take twelve stones out of the river Jordan and to place them together in one place in a pile where the people had passed through, to remain "to the people of Israel as a memorial forever" of what the Lord had done for them (Joshua 4:8-10). After the people passed through the Jordan River, "the waters of the Jordan returned to their place and overflowed all its banks, as before." (Joshua 4:18) This miraculous wonder became part of the living memory of Israel, and the event was celebrated in the worship of God's people ever since. The psalms which recall the divine action are sung at the Church's festival of the Epiphany as prefigurations of God's final act of the salvation of all people in the death and resurrection of His Anointed, the Beloved Son who was baptized in the same Jordan streams. The river Jordan was also parted by the passage of Elijah and Elisha, an event also recalled at the liturgy of Epiphany. (2 Kings 2) And it was from the Jordan that Elijah was taken up into heaven in order to return again, as the tradition developed, to prepare the way for the coming of the Messiah. (See Mt 17:9-13) It was also in the Jordan that Naaman the Syrian was cleansed from his leprosy, a sign referred to by Jesus as a prefiguration of the salvation of all people, not only those of Israel. (Lk. 4:27) In the account of Naaman's cure the special significance of the Jordan is stressed once again. Can we not be washed in just any river and be clean? God answers, No. 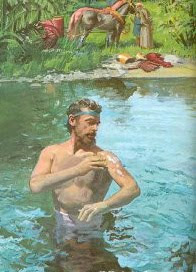 Only in the Jordan, in the baptism of Christ, are we cleansed from all of our sins. Only through the Jordan do we enter into the land of the living, the Promised Land of God's kingdom. Only by the sanctified waters of the Jordan does God sanctify us forever. Before Elisha's mantle when Elijah ascended.